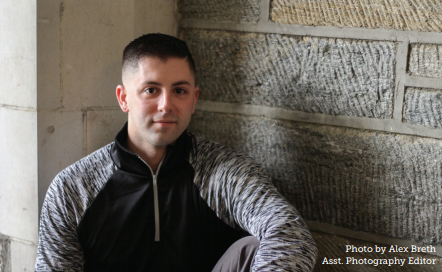 Mike Diorio is a 27-year-old veteran studying criminal justice at West Chester University. Diorio’s truly noteworthy experiences, both in and out of West Chester, contribute to the unique community that we at WCU are so proud of. Not only has being a veteran helped shape Diorio into who he is today, but so has his experience as a part of the LGBT community. “I had to move around a lot and live with a lot of different people. I think that’s where I gained my social skills. When I enlisted into the army, you weren’t allowed to be out. I could’ve gotten discharged. It’s really interesting now to see the total parallel shift from then to now. Today, they encourage you to be out and to have that kind of honesty with your troops,” he said. Diorio has recently been accepted into the National Geospatial Intelligence Agency, a government agency that uses satellites to support both military missions and humanitarian missions. During his time at this new position, he hopes to either earn his PhD or possibly start law school. However, in the meantime, West Chester University is lucky to have him as a student.